Brand new unit recently constructed. Only 1/4 mile to Short Sands Beach, local attractions & restaurants. Walking distance to three beaches including Long Sands or Cape Neddick Beaches. Fully furnished with everything you need. 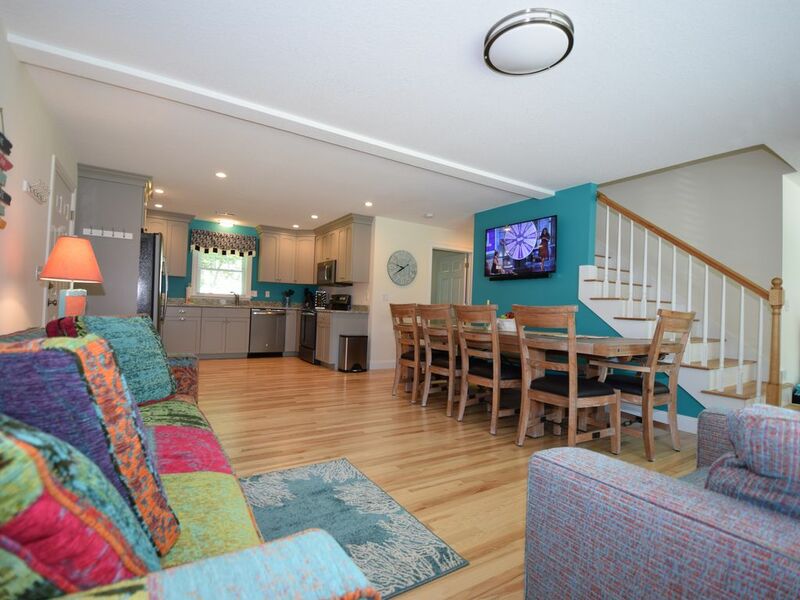 Large Dining Table, Central AC, All New Furniture & Appliances, Washer/Dryer, Pack N Play, High Chair, Large Backyard, Patio w/ Grill, Outside Games, Ping Pong Table (In Garage), Plenty of Parking, Towels, Linens, Beach Towels, Beach Cart & Chairs, bicycles, fire pit, etc. We own and operate our units personally and live in the area ourselves. Having moved to the area just a few years ago, we decided to invest in a few rental properties so others could come experience this wonderful area yourselves. Great getaway in a perfect location. Exceptional access to many local attractions and beaches. Layout of the unit is spacious, accommodating and comfortable. TV's in every room for those rainy days. Nice variety of sleeping accommodations for family get togethers. Nice backyard with patio, grill and fire pit. Fun for the whole family in a private setting. shower, Private Outside Shower. Perfect after a day at the beach! Only 1/4 mile from the center of Short Sands Beach. Telephone can be provided if needed. Central AC throughout the house. Extremely comfortable. All linens & blankets provided. Has Ping Pong table, bicycles, beach wagon, a few beach chairs, etc. High speed private WiFi. Great for streaming movies or having multiple users at once. Access code provided at check in. Plenty of towels. Some beach towels provided. With respect to all renters we ask that house towels not be taken to the beach. Thank you. Unit has both a Mr. Coffee maker and a Keurig coffee maker. Amazing Dining Room Table. Comfortably seats 12. Great for those family gatherings. Basic Time Warner Cable TV provided. Blue tooth sound bar in living room. Amazing sound quality. Easy to stream your favorite station. One in Master Bedroom & in Family Suite upstairs. 2 Adult and 2 kids bicycles. Large Patio with table & chairs and picnic table. We loved our stay at Pam and Mike's! It was extremely clean and comfortable! We truly enjoyed our New Year's stay at this property. It was extremely clean, and very comfortable for the group of adults we had with us. Convenient location, ping pong table, space, we couldn't have asked for more! We will definitely be coming back. Thank you Pam and Mike! Sorry we missed meeting you and happy to hear you all had a good time. The place does make it nice to assemble friends and family for any occasion. We would love to have you back soon. Happy New Year to all of you. There are few things that fill the heart more than having time with family at the holidays. We want to extend a great word of thanks to Pam and Mike for the wonderful experience of staying at 52B Main St in York. There was a welcome note/bottle of wine on arrival. We found the rooms both spacious and invitingly decorated. The kitchen is fully stocked with plateware, cookware and oversized refrigerator/stove—and the open concept allowed all of us to hang out together. We were able to comfortably fit us all at the table(s) for Christmas dinner. There is ample space in each bedroom, and many commented in the morning re having had a “great nights sleep”. This York property location is optimum for taking a walk to the beach—even on a crisp winter day. I suppose the only shortfall was that we wish we were able to stay longer!! Thanks Pam and Mike!! Loved the beach house. Very nice fixtures and enough space for the 3 Families that came together for the holidays plus gramma! Very accommodating owners. Ty! This condo is beautiful & very accommodating! Will rent again! Thank you again for staying with us and we are happy to hear everyone had a wonderful time. York in December can be a ton of fun with all the holiday celebrations going on in the area. 8 women annual shopping weekend first time not staying in a hotel and our best trip yet. Owners were so helpful. We already want to rebook for next year. The house is just beautiful! It is warm and cozy! We had a great time! Already planning to rent again! Please review our Cancelation Policy carefully. Even though the VRBO site (language we cannot change) says 100% refund if cancelations as done prior to 60 days, our policy is clear that we have a $150 processing fee for all cancelations. It also means you will forfeit the VRBO service fee. We are happy to discuss this further if you have any questions.